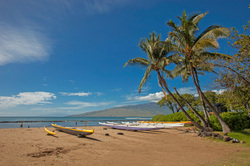 Across from Historic Kalepolepo Beach Park! This beautiful 4-bedroom, 3-bath home was purchased May 2010 and completely renovated. This spacious townhome is beautifully appointed with all new furniture and bedding throughout. California King Beds and Flat screen TVs are featured in 3 of the 4 bedrooms. The 4th bedroom, an airy loft with a privacy curtain that can be pulled across the width of the loft, features two twin beds and a private balcony. The living room features all new furnishings, a 52 inch HDTV, HiDef Cable TV and a Bluray DVD Player. This vacation home has BRAND NEW Split-air Air Conditioning cooling every room of the home, and ceiling fans throughout. The lanai opens up to a beautiful grassy area and the swimming pool is just steps away from your patio. Koa Resort has tennis courts, a Large HEATED Swimming Pool (one of the biggest pools in the area) and a hot tub. There is also a Cabana (w/ WIFI), ping pong table, and a shuffleboard court. We had a wonderful time, the condo was perfect! We cannot express how fabulous the condo and facilities are, they are the best! This is a large 3 bedroom, 2 bath upscale unit across from the beach. It sits on large tropical grounds and is very private and quiet. This is a large 2 bedroom, 1 bath ground-floor unit. Updated and very comfortable with tropical furnishings throughout. This is the largest 3 bedroom, 2.5 bath unit in the complex. 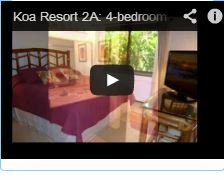 Located on the ground-floor, it has been remodeled with coastal and tropical furnishings throughout.